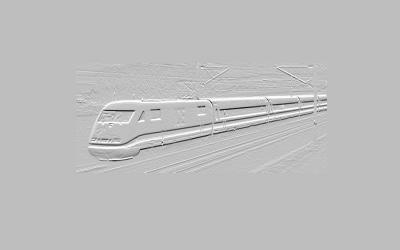 Meanwhile there is some information about the new Märklin Decoder 60901 (with motor) and 60902 (without motor) in the Internet. At this page I want to collect, what information meanwhile arrived me. This information still is not complete, whoever knows something new, is invited to contribute to a completion. First I might remind however, that I have examined this information to best knowledge and consciences. I cannot rule out however, that there may be mistakes existing in the sources of my information, or I may have added additional mistakes. Therefore I don't accept any liability for damages, that originate out of the utilization of this information. over-current and short-protection for the outputs. In the usual version of the Decoders the functions F0, F1 and F2 are completely implemented. For the utilization of function 3, 3 more parts need to be added, and function 4 is normally used for the internal control of the acceleration and braking. You can also utilize the F4 as an output with addition of some components, however the switching off of the acceleration and braking delay is then no longer possible. When operating with the conventional transformer (AC), in contrast to the C90 the function F0 (journey-direction-dependent) and F1 are continually on. The functions F2, F3 and F4 are continually off. The blue coloured components are not included in the standard decoder. Further details are discussed underneath in the section “expansions”. The functions F3 and F4 can be added. 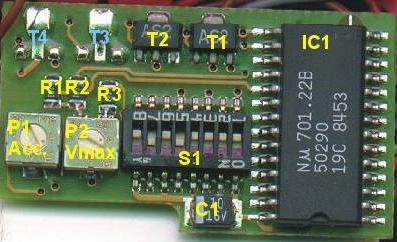 For activation of the function F3, the components R7, R11 and T3 are added and the brown/yellow wire at the corresponding solder pad at the edge of the board. For the function F4 a little more is required. The components R8, R12 and R13 and the Darlington transistor T4 are added. Further, the solder pads at S4 must be bridged. This disables the internal function "Rangiergang (shunting) at F4" and makes F4 available externally. A corresponding brown/white wire is soldered to the output solder pad on the board. Whoever wants the telex-function that the delta Decoder 66031 has, can do this by adding the same components as for F4, but bridge S3 instead of S4. Thereby this additional function is, same as with the Delta-Decoder, also usable in the conventional AC operation, and the internal function "Rangiergang at F4" remains. The function becomes then activated through several changes of direction. In the end one more little candy. Viewing closely the circuit will show that the pins 13 and 14 of the 701.22B are not connected to anything. These two pins are used in the ICE or Cargo Sprinters to facilitate switching the pickup shoes. At the switching of the journey-direction a short pulse (about 50 ms) is outputted on the corresponding pin, so one can connect the two coils of a bistable Relay (protection diodes necessary!) from these to pin 20 of IC1 (that is, one side of each coil goes to one of pins 13 and 14, the other side of each coil goes to pin 20).